We welcome you to visit our Classic Car Museum Auto Exhibit featuring over 80 of the world's most distinctive automobiles. The exhibit is a rotating collection of antique, classic and unique autos assembled from private collections. Included among these are several owned by Don Laughlin himself, an avid auto enthusiast and collector. 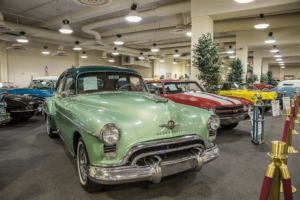 Don Laughlin’s Classic Car Collection has something for you! Housed in two separate areas on the resort property. The exhibits are open seven days a week and admission free with your King of Clubs Players' Club Card or $2.00 per person if you do not have a Players Club Card. The first exhibit is adjacent to the resort's main valet entrance (ground floor near the north tower). The second and substantially larger Classic Auto Exhibition Hall exhibit is located in the South Tower of the casino on the third floor. the Classic Auto Exhibition Hall on the third floor of the south tower. It boasts a glass curtain wall with a commanding view of the Colorado River. The entirely climatic hall encompasses approximately 30,000 square feet and includes a gift shop. Free Admission with your King of Clubs Players' Card! $2.00 Per person without King of Clubs Players' Card. Looking for Antique Car Sales?